A nice big bike pic, so the details are possible to see. You're are right about the Italian origins, for the engine at least. That logo says Minarelli, quite distinctive. 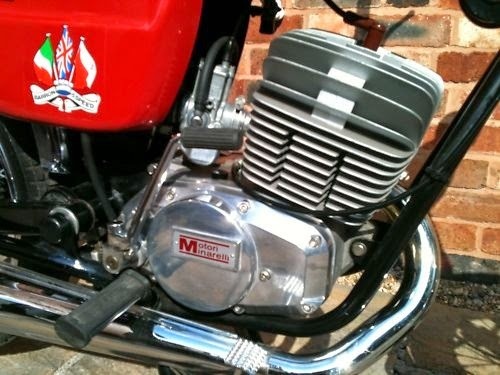 The difficulty is that Minarelli sold LOTS of engines, to all sorts of manufacturers, so the cycle may be a little more tricky to place - unless someone who has had one just knows straight away what it is. Now, the decal on the sidecover sez Ken Roberts - is that period, or is that you ?? Now, its unlikely that THE Kenny Roberts rode this bike, but could he have sold/supplied it. Which would indicate its in the USA. ? Thanks for the reply. The bike was purchased from a dealer called ken Roberts in the UK so the sticker is period. I don’t know if this photo is helpful or not ?